Play Sorceress™ online for free now! 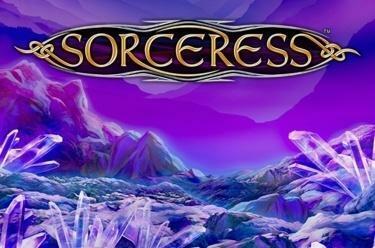 In the slot Sorceress™ you will be taught winning sorcery on 5 reels with up to 50 pay lines. Your teacher, the sorceress herself, as well as the Scatter, the crystal, can conjure up the biggest winnings. 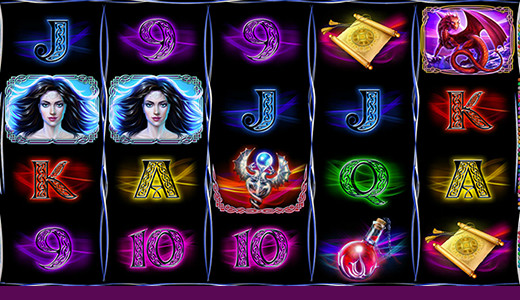 Your aim with Sorceress™is to land 5 identical symbols along one of the win lines. All win lines start on the first reel to the left and run to the right up to the last reel. The magic crystal is Scatter as well as Wild symbol: It triggers 10 free games with expanding special symbol if it lands at least 3 times in any reel position. Moreover, the crystal can substitute for all other lucky symbols and therefore increase your chances for correct combos! Depending on how many Scatter symbols trigger the free games (3, 4 or 5) you earn 5, 6 or 7 so-called Switching Spells. These enable you prior to the free games starting to use two arrows to choose between randomly arranged game symbols and select one of them to act as an expanding special symbol in the free games. But look out: Once you have used up all your Switching Spells (meaning clicks on arrows) the symbol that is currently shown turns into the special symbol. The special symbol pays in any reel position on all active lines and expands to all positions of the reel it appears on. Something strange is going on here: Red dragons are flying through the air, magic crystals are predicting great Twist wins and a beautiful magician is bewitching the reels with her spells - welcome to Sorceress™! Discover your gift for black magic and let the ruler of the slot teach you her spells: with their power you can select the best symbol for free games and conjure up a magic number of Twists in your player account!